In 1997, a little game called Final Fantasy VII came along and changed the RPG genre. 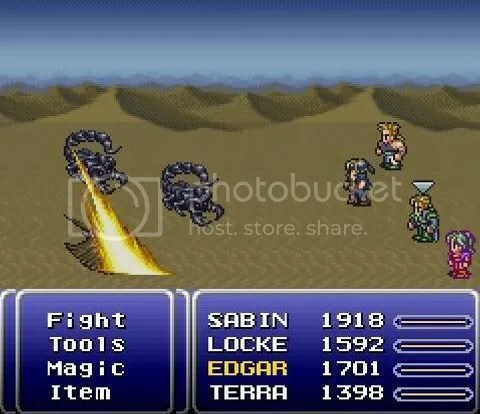 However, one thing this game did not change was the glow of its powerful predecessor, Final Fantasy VI (and it hasn’t done so to this day, either!). 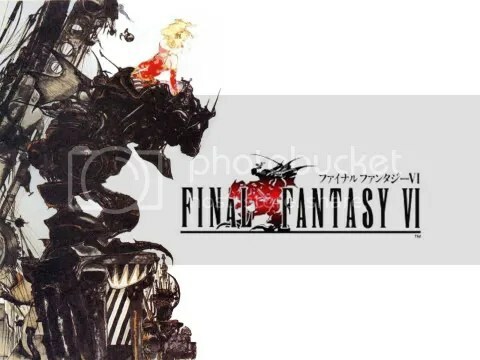 Released for the Super Nintendo and known in Japan as Final Fantasy III, Final Fantasy VI takes place in a steampunk-like world on the brink of industrial revolution. Those who want power must acquire it with their bare hands, as the power known as Magic was put to an end during a war over 1000 years prior. Humans developed technology to make up for it, but magic is beginning to stir once more, and those with dark intentions are attempting to harness it, and they make their move when the barrier between their world and that of the magical creatures known as Espers begins to weaken. Gestahl, a powerful general, puts magic and technology together to create powerful and fearsome weaponry, but he is challenged by the Returners, a group of rebels who wish to stop his evil ways. In this game, you primarily follow the story of Terra, a Magitek soldier who is really under the control of a device. She is set free from her brainwashing by Locke, one of the Returners, and her new-found freedom will force her to decide what she believes is right as she forges a path to finding the secrets of her past and to saving the world from total destruction. The plot of this game holds many twists and turns, so many in fact that I can’t really think of a way of explaining more than what you’ve read above without giving things away. However, I can tell you that as you continue on in your adventures, many new friends will join your quest. These characters range in type from a primative little boy to an actual king, and each character is deeply developed and downright lovable. The story and character development starts off rather slow in my opinion, but stick with the story and you will quickly become invested in the tale being artfully woven in front of you. The gang battle some huge scorpions in a desert, one of the many types of setting you’ll travel through in this game. The gameplay is standard old-school Final Fantasy gameplay, which is not a bad thing in the slightest. Each character has their own special abilities such as Terra’s magic, Edgar’s crazy inventions, and Gau’s ability to learn skills and attack patterns from enemies. This makes each character unique and fun to fight with, and you will quickly find yourself forming your own personal favorite party to take into battle. This also ensures that battles are never boring, as a quick switch of a party member or two is often enough to shake things up if you get bored (which I highly doubt you will). However, this can be hot and cold at times; Edgar’s inventions are always useful and quite powerful, while, in my opinion, Gau’s ability to learn enemy’s skills is severely handicapped by the fact that you can only learn skills from enemies in one specific area, which is located near where he first joins your party. You will find yourself stopping your adventure to gather some powerful enemy attacks for Gau, then find he stays rather stagnant battle-wise until you can find a means of returning to that area of the world map again to grab and abilities you may have missed out on. This resolves itself before you get that chance however when you gain the ability to equip Espers to your characters which, when leveled up, will let your characters permanently learn spells and abilities. Give each character some time with each Esper and you could teach each character every spell in the game, although this would be very time consuming. As for the graphics, they are also very standard for Super Nintendo RPGs. Still, the character designs are fun and the location designs are powerful. When paired with the always incredible music that Final Fantasy games consistently offer, you will often get chills down your spine as you walk into a spooky place, or feel yourself perk up as you stroll through a bright, sunny town. This adds to the emotional roller-coaster that the story takes you on, and when put all together, it makes for a truly unforgettable gaming experience. That really is the best word that I could use to describe Final Fantasy VI: Unforgettable. It simply delivers in every area that a good JRPG should, and is one of the most well-rounded RPGs i’ve ever played by far. If you haven’t played it yet, there’s no excuse for you to wait any longer! Go, now! EA Starting Up A Potential War? That was my first thought when I read this article from The Consumerist about EA’s decision to disallow online play for used copies of their sports games unless the person purchasing said used game is willing to pony up some extra cash for it. Starting with the release of Tiger Woods PGA Tour 11 on June 8th, all EA Sports games going forward will include a code in the case, and you’ll need to type in that code in the menu in order to enable online play. If you buy an EA Sports 11 game used, or if you rent one, or if you borrow one from a friend, you’ll have to buy a code from the Xbox Live Marketplace or the PlayStation Store for 800 Microsoft Points or $9.99, respectively. Of course, EA Sports will still afford you the privilege of purchasing DLC (or downloading free DLC) for its games, but without an Online Pass, you’ll only be able to use the content offline. Thankfully, EA Sports has included a provision for renters and borrowers: if you don’t want to buy a code, you can activate a free seven-day trial of online play — but you can only do it once per EA Sports game. Surprisingly, GameStop is on board with the EA Sports Online Pass — the retailer will be selling Xbox Live Marketplace points and PlayStation Store cash cards alongside the 2010 EA Sports games. So in short, you can pay an extra $10 to play with your used game online or buy a new version, which will now include codes to activate online play. This makes no sense, since, as The Consumerist points out, GameStop normally sells used copies of $60 new games for only $5 less, meaning you’re actually paying an extra $5 for the full functionality of the game if you want to buy it used. What does this mean? Well for one, any buyer with half a brain won’t be buying used copies of sports games until they go further down in price, which will inevitably slow down and in some cases even cease sales of used sports games, which is sad for GameStop since I’m sure they make quite a bit of money off of them. This also leads me to wonder why GameStop is being supportive of this, and my only guess is that they would rather comply than incur the wrath of Microsoft and have their products reduced in number or even pulled out of their stores completely. Secondly, this will slow down and/or cease the renting of these video games, since the price to buy online play is more than it costs to rent in the first place. They’re also trying to smooth things over by giving 7 day trials per used game, but that means the first person to buy or rent the game are going to be the only ones able to enjoy the online play. This seems pretty pointless to me. So, is this going to start a war of sorts? Quite possibly. GameStop is being compliant so there won’t be any trouble on that end, but people who are strong advocates for used gaming are surely going to be angry, and the nonchalance of those who don’t participate in used gaming will probably piss them off even more. I personally am a huge fan of used gaming; almost all of the games I buy are used. In this economy, saving that little bit of money helps quite a bit, especially when you’re buying an older game that is deeply discounted from its brand-new price. However, I also have to admit that I abhor sports games, so personally this doesn’t affect me and I really find it hard to care, save for the fact that this may wind up spreading to other kinds of gaming, such as first-person shooters or RPGs that are played online. If this move becomes successful in Microsoft’s eyes, you may very well find yourself shelling out extra money to play future entries in many popular game series, and that does not sound very nice to me. Feel free to leave comments with your own thoughts and opinions! When I recently purchased a used Playstation 2 (I have two fat PS2s at home that are completely broken and I was tired of my PS2 games collecting dust), I purchased both Persona 3 and Persona 4 for it. I had seen my friends play these games and fell in love with them, and nabbing copies of my own made me decide to search good ol’ YouTube for some Let’s Play series on some other Shin Megami Tensei games (for those who don’t know, a Let’s Play series is a series of videos where a person plays through a game, usually with commentary). The first one I came upon was for Shin Megami Tensei: Digital Devil Saga, so I decided to take a look. The game started off slow at first, but as the storyline developed, I quickly found myself hooked. The story starts in a dark, drab techno-future world where people are living in tribes, seemingly peacefully because they have no idea or concept of emotions. Suddenly, a meteor hits the planet, leaving behind a big crater and a mysterious girl named Sera who has no memory of who or what she is. Whats worse, everyone has started turning into monsters, and Sera’s singing is the only thing that can soothe these savage beasts! The tribe leaders meet with an omniscient being named Angel who tells them that the only way to survive is to kill the other tribes and take Sera to a place called Nirvana. The main character, Serph, is the leader of the Embryion tribe and the keeper of Sera, who seems to remember him. As the humans begin to learn to control their monsterous forms, they begin to feel and understand emotion, which starts driving them to do some pretty crazy things that shakes up the sudden and deadly war to reach Nirvana. What really makes the story shine is watching the characters learn emotions and try to figure what to do with them. Some learn love, others learn loss, and many learn what the burning of justice and righteousness feels like, and it fuels their desires to make their own paths to Nirvana. As you may be able to tell by some of the names and terms I’ve mentioned, this game is heavy with religious connotations (as are many other Shin Megami Tensei games), and this adds a whole other level to the storyline and the meaning behind many of the characters thoughts and actions. The gameplay is pretty straightforward for an RPG, and if you’ve played SMT games before, it won’t be anything too new for you. Characters gain experience, level up, and earn money through battles. What is unique about the gameplay is that they learn techniques by purchasing Mantras, which are sets of abilities. You level up your Mantra by devouring creatures that you fight until you earn the abilities. However, you must frighten the monsters first; eat them too quickly and you’ll fail. You also run the risk of getting a stomachache, which greatly decreases your stats in battle. The only problem I have with this is system that the Mantras seemed pretty expensive compared to the amount of money the player was pulling in, and he wasn’t running from any battles, so you really have to put in the time to grind if you want to earn some of the better abilities in the game. If you’ve played SMT games before, though, the need to grind will be more than familiar to you. Other than that, its a basic RPG/dungeon crawler. Unfortunately, it falls into the trap of having the dungeons look too much like each other. The repetitive rooms and drab color schemes are probably this game’s biggest downfall. The one thing that is certainly not drab however is the music. 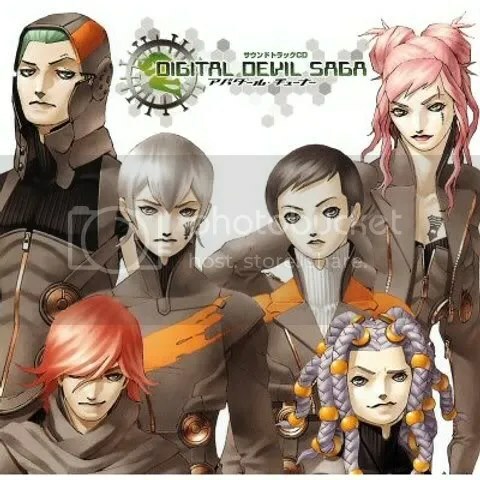 Anyone who has played a SMT game knows that the music is always killer, and Digital Devil Saga certainly doesn’t disappoint in that regard, with its gorgeous soundtrack ranging from transient and calm to energetic and ripe with guitar riffs. The music may get a bit repetitive at times, but its pleasant enough that it really doesn’t get on your nerves at all. So if you’re looking for a good PS2 RPG that is fresh enough to set it apart from other members of the genre but familiar enough to be able to pick up and play, then Shin Megami Tensei: Digital Devil Saga is definitely a title to consider. Check out TheLastCaipora’s Let’s Play of Shin Megami Tensei: Digital Devil Saga for yourself here! Purchase Shin Megami Tensei: Digital Devil Saga via this link and you’ll be supporting Chu*Blog at no extra cost to you! Thanks in advance!